The Fokker D.XXI was a low wing monoplane with a steel tube fuselage covered in large part by fabric. Following some of the standard Fokker design practice, it had wooden wings and a fixed spatted undercarriage. Power was provided by a Bristol Mercury radial driving a 3-blade two pitch airscrew. When it entered service in 1938 it was a quantum leap forward for the Dutch Army Aviation Group though. Until then its fighter force had consisted of aging biplanes with open cockpits. The new Fokker proved to be an extremely sturdy aircraft capable of attaining a speed of 700 km/h in a dive. In 1936 a few were ordered by the Spanish Republic. Although the order by the ML-KNIL was cancelled, the Luchtvaartafdeeling (Dutch Army Air Force before World War II) placed an order of 36 aircraft, which were all delivered in time to participate in the war against the Germans in May of 1940. The Fokker D.XXI, although much slower and more lightly armed than the Bf 109, performed surprisingly well in dogfights, due to its maneuverability. Nonetheless, the numerical disparity of the Luchtvaartafdeeling compared to the Luftwaffe resulted in the destruction of most Dutch Fokker D.XXI fighters during the campaign. Some were captured during and after May 15th, but their fates, apart from their capture, are unknown. Same can be said of the Danish Fokkers. Seven were delivered from Fokker and an additional 15 built under license. The major difference in Dutch and Danish aircraft were that the Danes had some armed with a 20mm Masden cannon in a housing under each wing. The Fokker D.XXI performed better and for much longer in the Finnish Air Force, which had acquired a number of licence-built fighters prior to the start of the Winter War. Against the aircraft of the Soviet Air Force, the Fokker was more evenly matched, and its rugged design with a radial engine and fixed undercarriage made it very suitable for Finnish conditions. Later in the war, as newer models of Soviet fighters appeared, the Fokker D.XXI was underpowered and too lightly armed (with only four .30 caliber machine guns) to compete. Plans to arm the Fokkers with 20 mm cannons were dropped and only one fighter was armed as such (two 20 mm cannons and two .30 machine guns). Another fighter was equipped with retractable landing gear, but due to bad performance, wasn't continued in the series. During the Continuation War (1941-44) the Finnish State Aircraft Factory (Valtion Lentokonetehdas, VL) also built some fifty D.XXIs with the Swedish-built Pratt & Whitney R-1535 Twin Wasp Junior as the Bristol Mercury was in short supply. These can be identified by their longer cockpit glazing, smooth cowl, and large ventral air intake under the cowl. 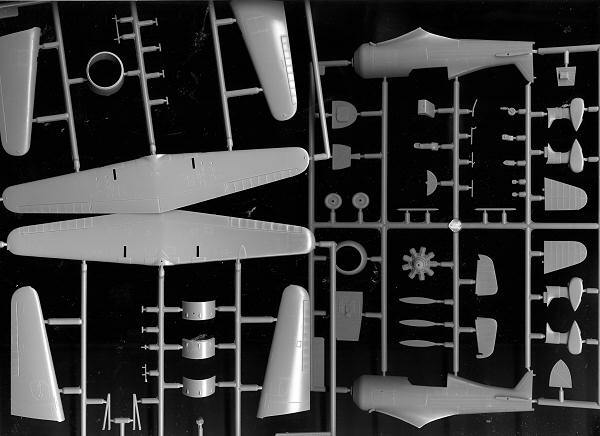 MPM's kit of the Danish Fokker is not brand new. Attempts at trying to determine when it was molded were stymied by a lcak of any dates on kit box, instructions or decals. However, it is a short run kit with the usual resin and photo etch bits, but with an injected canopy. Observant readers will notice that MPM provides two complete wings. 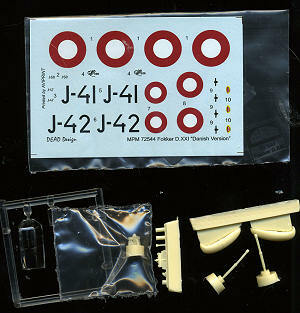 Well, one set is not for this kit, but has a part on it needed to complete the model. There are other parts that won't be used as well so the spares box will be getting a bunch of bits from this one. 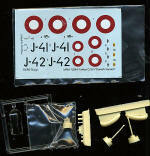 Resin is used for the prop hub cannon fairings and barrels as well as a few other small items. Photo etch (not shown) has an instrument panel, seat harness, wing access panels, cowling brace and other little bits here and there. Some sprue stretching will be needed here and there, but nothing major. There are five camo options and the instructions point out just exactly which options go with which. For instance, there is a two bladed prop for option A, smooth cowling for options D and E, as well as a few other detail differences. Thankfully, the instructions are well done in pointing out what goes where. Gunze paint references are used throughout and there are five markings options. Three are overall silver and two are camouflaged. The camo ones are devoid of large code letters and require the landing gear to be cut to remove the oleo cover. The camo versions are olive green/brown over light blue and are the wartime markings. Prewar had the large codes and were in overall silver lacquer as shown on the box art. Decals are very nicely printed by AviPrint. If you are one who is somewhat comfortable with using resin and photoetch, as well as handling small fiddly pieces, then this kit is one you should seriously consider. The Fokker D.XXI has always been a favorite amongst modelers and this provides one of the versions not always kitted. If you want this kit or any one of many others, visit www.greatmodels.com and see what's there.